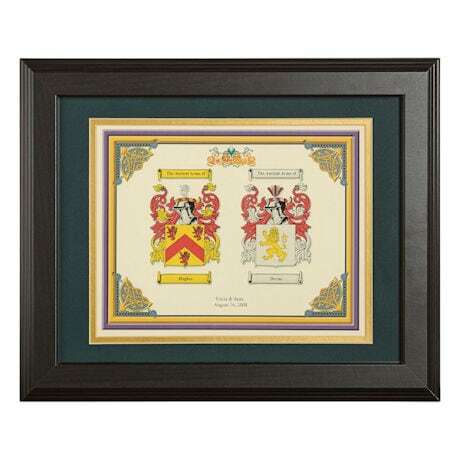 Personalized Wedding Coat of Arms Framed Print: 11" x 14"
Celebrate the joining of two great families or observe an anniversary. Almost all families of European descent have coats of arms, some dating as far as the 12th century. Printed on acid-free ivory card stock, double-matted and framed in dark-finished wood under Plexiglas®. 11" x 14" or 16" x 20". Specify wedding date (month, day, year); specify first and last names (maximum 24 characters each). Over 1 million names are available. Allow 3 weeks for delivery. Item can only be shipped within the Continental US.